St Teresa was born in Skopje, the Republic of Macedonia, to Albanian parents. Following her father’s death at 8yrs, she was raised by her mother, a Roman Catholic. At 18, she joined the Sisters of Loreto and briefly studied English at Loreto Abbey, Ireland. In 1929, she went to Loreto Convent School in Eastern Calcutta as a teacher and novitiate. She took her solemn vows in 1937 and served as teacher and Headmistress for almost 20 yrs. In 1948, deeply affected by the poverty and famine surrounding her, St Teresa embarked on a new mission. She adopted the now famous white habit with a blue border, received basic medical training and started a new school among the destitute and starving. Soon she was joined by other women helpers which in turn led to the origins of a new Order, the Missionaries of Charity. Its purpose was to help, “The poorest of the poor – the hungry, the naked, the homeless, the crippled, the blind, the lepers, all those who felt unwanted, unloved, uncared for throughout society, people that had become a burden to others and were shunned by everyone”. The work of her Order attracted many like-minded women and, by 2012, it had over 4,500 sisters working in 133 countries. St Teresa received numerous awards during her lifetime; including the prestigious Nobel Peace Prize in 1979. St Teresa once said, “By blood, I am Albanian. By citizenship, an Indian. By faith, I am a Catholic Nun. As to my calling, I belong to the world. As to my heart, I belong entirely to the Heart of Jesus”. St Teresa’s Feast Day is the 5th September. 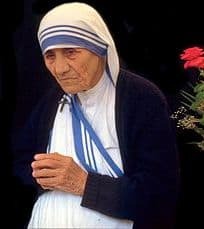 She is the Patron Saint of World Youth Day and the Missionaries of Charity. We pray to Jesus for a heart as beautiful, pure, and spotless as His. A heart like His, so full of love and humility.